The day after the fire, the whole of the population of Montréal was in a state of shock over the number of houses that had been destroyed. The Hôtel-Dieu, which had just been reconstructed following the fire of 1721, was again in ruins. Hundreds of the city's inhabitants had lost everything and were left homeless. The Hospitaller sisters had to sleep under the stars during the cold nights of April 1734. The rumour spread fast: Angélique, the slave of madame De Francheville, had set the fire, possibly with the help of her lover, Claude Thibault. Relying on the "Ordonnance criminelle" of 1670, the king’s prosecutor had an arrest warrant issued against Angélique based solely on this public rumour. The accused was arrested in the garden of the paupers of the Hôtel-Dieu and led to the king’s gaols. And so began a long trial spread over several weeks in which twenty or so persons of various social standings, some men, many women, and a few children, were called forward to testify. Angélique was subjected to numerous interrogations and confronted with the witnesses; nevertheless, she was adamant and denied being the perpetrator of the crime. The other suspect, Claude Thibault, had fled and his whereabouts remained unknown. The court authorities tried to intimidate the accused by interrogating her not once but twice on the criminal seat and by confronting her with her mistress, madame De Francheville. In view of her refusal to admit her crime, Angélique was sentenced to die and her trial was sent to the appeals court at the Conseil supérieur in the city of Québec. The appeal was rejected and Angélique was subjected to torture with the ‘boot’ prior to being executed in Montréal on June 21, 1734. 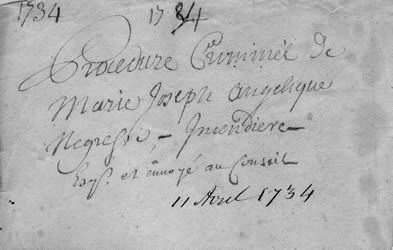 In this section, you will find all documents related to the trial against Angélique, which are listed in chronological order so that you may follow the events as they unfolded, from the request by the prosecutor for her arrest on April 11, 1734 to her public execution on June 21, 1734.